These days people are as likely to apply for jobs online as they are using a traditional high street recruitment agency or replying to an advertisement in a paper or trade magazine. You may receive emails from recruiters on a regular basis, even regards to jobs you don’t remember applying for, or your cv may have been put forward without your knowledge. Small wonder people click on links in emails, or start going through with an online application process on the basis of an email they receive. But, be careful. There is a large variety of internet job scams, they are ranging from fake jobs advertised, to scams that try and collect your personal information, or scams that ask you to spend money on various fees or administrative charges, or make other purchases. We have seen an increase in scams like this. Scammers pretending to be recruitment agents advertise attractive job opportunities with real companies and offer huge amount of income and other benefits. Eventually it turns out that the victim is required to pay them a fee in advance for their service charges, visa charges or travel costs. The website name keep changing, very often weekly or monthly as their websites get blacklisted. 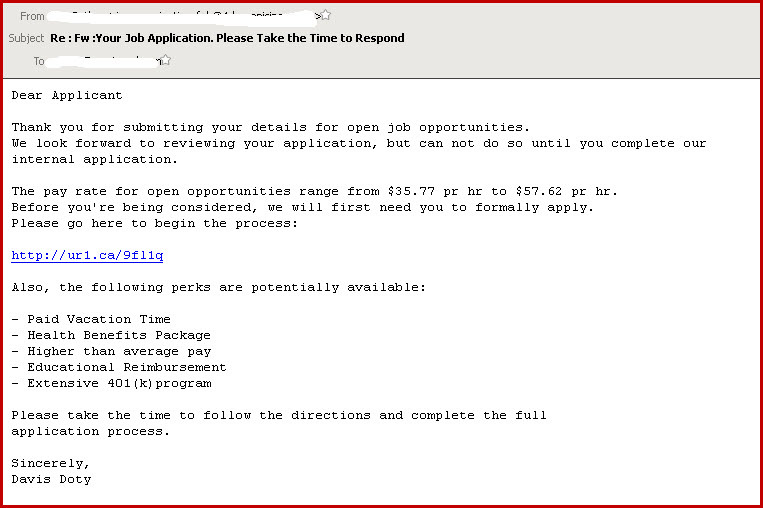 Whether or not you have applied for a job recently, and you receive an email such as the one above, you would be right to be suspicious. Invest a little time in investigating if it is legitimate before you start giving your personal information, and before you are duped into parting with money or giving your credit card details out.